It's really rare that we get to spend time together, just the three of us. Chris works 4 days a week and has college 2 days a week. This leaves us only 1 day so we try to make the most of it. The Christmas Continental Market arrived here on the 15th November and we still hadn't been so decided to head down yesterday. I love the market. There are so many food stalls from around the world as well as stalls where you can buy little gifts too. It can be quite expensive though. We had a walk around but didn't see any gifts that caught our eye so we just decided on getting food. Had to be done! Chris got a wild boar burger & shared it with C. He gets one every year - they're delicious. I opted for The Bellybuster. 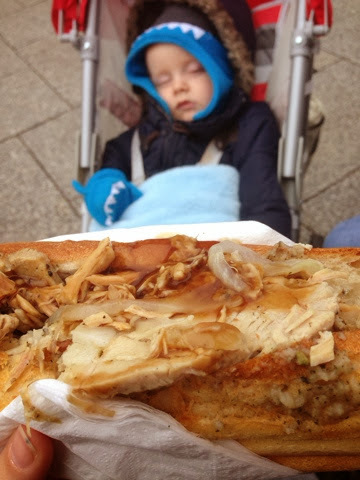 This was a pulled pork baguette with sage and onion stuffing and gravy. It was so lovely but a bit awkward to eat as we walked around! 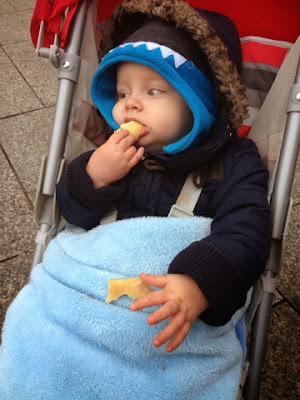 When we left the market, we took C to Clarks. His cruiser/crawler shoes are too small for him so he desperately needed a new pair. 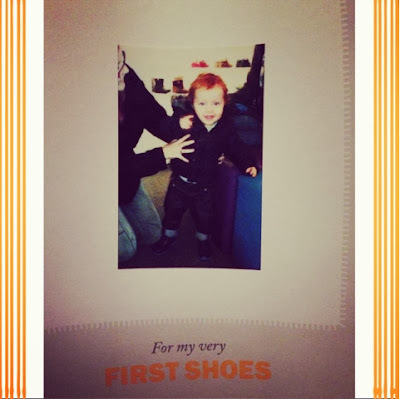 On Saturday, he started to walk on his own so after our failed trip to Clarks 3 months ago, I really hoped he could get some lovely shoes this time. And he did! We tried a gorgeous pair of blue shoes on him. They had rockets on the side and lit up whenever he walked. I was so surprised that he was okay in them as last time, he couldn't even lift his feet in walkers because they were so heavy. The lady took his photograph and he looked so happy and proud.